This is a complete package that includes basic pack and advance video module pack, along with done for you marketing materials. Being Able to Define Success: You will be able to define success, which most people cannot, and often, they have more trouble achieving their goals because they don’t know exactly what success is for them. You will not only know what success means to you; you will also know what successful habits are so that you can create them easily. Replacing Bad Habits with Good Ones: Instead of learning how to get rid of bad habits, this book will teach you how to replace them with good ones. There is a very specific reason for this, and it has to do with the psychology behind habitual behaviors. This will be explored in much more detail in Chapter Four. Forming Permanent Habits That Will Stick: You will also find techniques for making habits permanent. Eventually, you want to reach a point where your good habits happen automatically, without you having to consciously think about doing them. These permanent habits what will carry you along the road to success and the faster and more strongly you can make them stick, the faster you will achieve a higher level of success. Getting the Confidence to be Successful: People often lack the confidence that they need to be successful and a lack of belief in oneself is one of the main reasons that people fail. This book will demonstrate techniques and tips on gaining that confidence so that you have a foundation for success. Identifying What Triggers Bad Habits: When you do an action habitually that has negative consequences, it is usually because something triggered it. Both types of habits – positive and negative – have triggers and learning what triggers your bad habits can mean putting a stop to them. Creating Triggers for Good Habits: Triggers do not just prompt negative habits. You can create triggers for good habits as well. In this book, not only will identifying negative triggers that prompt destructive habits be covered, but also identifying, creating and maintaining good triggers so that positive habits can be developed in their place. These good triggers can then replace the negative ones so that an entire overhaul of your habits takes place, where negative habits begin to quickly get replaced by good ones and you start seeing real changes in your life. Motivating Yourself to Start the Journey: In addition to triggers, you will also need motivation, and you will need a great deal of it the first few days that you are working on a new habit – or series of them. You will also learn how to create habits that reinforce each other which adds to your motivation both initially and over the long-term. Motivation to Stay on Track for 30 Days: 30 days is the key to developing new habits that become deeply ingrained in your mind and body. If you can consistently perform an action once a day for 30 days you will be on track to making it a permanent fixture in your life. This book will teach you how to make it through those thirty days, including an entire section on the first few days of the journey, which are going to be the hardest. Overcoming Obstacles that Stand in Your Way: Finally, you will also get the benefit of expert advice on overcoming any obstacle that stands in your way, whether that be your family and friends being less than supportive, personal issues that make you want to put off your plan for another time and many more, both expected and unexpected, because you will encounter both. 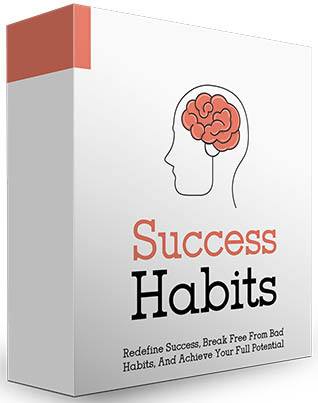 Video #1: 5 ways to make success habits permanently ingrained.